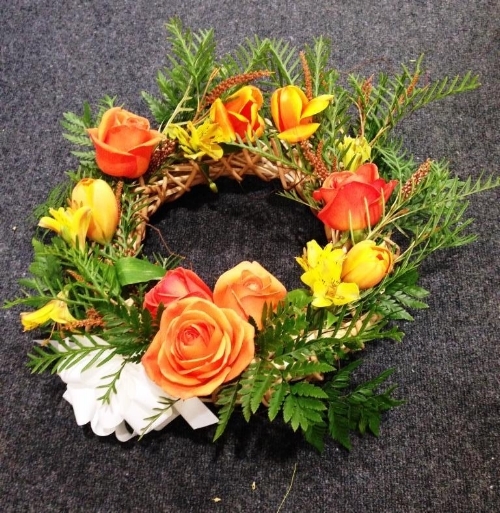 A stylish funeral wreath designed with the families favourite colours and greenery from there trees. I understand that this can be an emotional and hard time for everyone involved. I offer a sincere and caring service and will assist in creating the flowers that most represent the life being remembered and their journey. Sending Flowers to someone you love at this time of need, I take special care in designing appropriate beautiful blooms to show that you are sincerely sorry for their loss. Flowers are a very comforting gift that means a thousand unspoken words. I provide full range of sympathy tribute flowers from sprays, crosses, wreaths and bouquets. Please call Kay on 03 545 8558 or 027 555 8518, email Kay or come in-store to discuss your needs.